This picture is from 1965. Fairlie Place College was a Finishing Boarding School for foreign female students but had a secretarial department as well which also served the local community. Besides Mrs. Cartland, the director, I see in the picture Miss Sylvester, our housemother, Ms. Markham, our English teacher and Ms. Duncan-Jones, our Shakespeare Dramatic Interpreter, who was so inspiring. I recognize my former classmates, whom I would love to hear from again – in particular: Farideh, Fahimeh and Shanaz from Teheran, Gladys Debbas from Addis Ababa, Christina from Venezuela, Nadia from Italy, Eva from Germany, Geraldine and Edith from France, Vanee from Thailand. I have written a book in German which describes in great detail Fairlie Place College and my experiences there. I am from Germany, living in Los Angeles now. Please contact me if you recognize this picture. P. Healy – were you Pat Healy? The name rings a bell. I went to Fairlie Place, to the Secretarial College, around 1960-1961. I remember Mrs. Cartland. I made some good friends with some of the boarders especially Daisy from Venezuela, and Gunilla from Sweden. Gunilla and her sister came over to visit a few years later and unfortunately had their camera stolen from my parent’s house in Haywards Heath (during their one and only burglary.) I went to the College daily on the train from Haywards Heath with Lindsey (née Boryer). Only a year there but so many memories! I have to admit their strict education made us very efficient secretaries with very straight backs! I also remember the names Carol (Egerton?) and Melanie (Bernard?) amongst other “day girls”. I believe you have both been in touch with Lindsay? Melanie, I still have a photo of us taken in one of those booths taken on a “day off” (!) from College. Great to read something about the College on this site! I would like to add to my previous mail that I would of course be very happy to meet any of the girls who attended Fairlie Place College during the year 1966/67 and not only the girl’s name which I wrote in my first message. I hope to have some news very soon. Dear Janet Wood, yes I am Pat Healy. How are you? I came to stay at your house in Haywards Heath one holiday. I remember your dad Philip and your mother at Oathall Road? I remember one of your friend’s David De Lacy (?) Also I have some pictures of Fairlie Place. Yes, nice to see your message! My name is Patricia Rahn, nee Brackley. I was a boarder at F.P. from 1961-62. It was a great year with many happy memories. I would love to get in touch with any one who remembers me, especially my good friends Murial King from Liberia and Kaniker Chaturehinda from Thailand. My husband is German so I have ended up living here. I have lots of interesting F.P. photos. Hope to hear from someone. I was at the Secretarial College in 1960/61 and was’ finished off ‘ as well! Would love to hear from any ‘girl’ in that era. Do you have a contact for Gladys Debbas? I would love to find her. We practically grew up together in Addis Ababa and lost track of her. Hope to hear from you soon. I was at Fairlie Place 1962/3 as a boarder doing a secretarial course. I remember Thelma Katchaturian, Edna and Aida from Tehran, Chutapahn from Thailand, Rosemary Acheson and many more. Contact me if you remember me too. Patricia. Hey there, I’m Nicki from Greece from yellow bedroom. I’m very happy I found you on the internet. I would like to hear from you. Please send me your email address, so that we can contact. Very, very sincerely yours Nicki. Dear Ruth, it is only recently that I discovered this site about Fairlie Place College. It was in 2009 that you asked about some girls during our time in 66/67. I have been there too in 66/67 and I still have contact with Nicoletta, Kristin Gisladottir from Iceland and Vivian Eskenazie who lives in Israel now. I have their addresses so if you want to I can give them to you. I am sure that Nicoletta can give you the address of Katrin Vosikis. After looking in my photo-album it was nice to see all the girls and wandering what became of them. Hope to hear from you sometime. To Pat Healy. Hi Pat, I have only just had another look at this site. I do remember you, and would love to know what you have been up to these past (50?) years. Where are you living now, do tell, I live in France and have done so for years. My dad was named Cliff but otherwise you were correct in your memories. I presume there is a way on this site of writing more personally to me? I was also there in 66/67 and I lost contact with all of you. I was “”Miss Barceló”, from Mallorca, Spain and we had such a nice time. I have looked in Facebook, but most of you change the surname when you marry. I’ll be very happy to have any news from any of you all. To Anna Zwart: Dear Anna, just discovered this page! I was with you and would be very happy to know about you, Nicoletta, Katrin and all of them. How can I do it? Dear Lolina, It took some time before I discovered your reaction on this page. I can give you my email address abs.boonstra@planet.nl. So if you want to come in touch with me you can send me an email. Best wishes Anna. 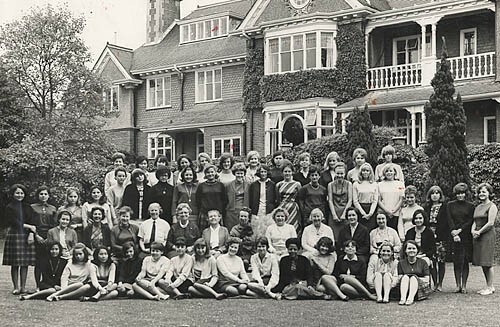 I was also at Fairlie Place in 1966/67 as an English secretarial student. I remember Lolina, Anna, Kristin, and still have my group photo from that time. My best friend was Jill from Bermuda. Hi to all of you, I was at Fairley in ’61- ’62 (I think! ), and am still in touch with Gill Taylor, Jane Hodgkison, but lost track of Farah and Thelma (both Iranian); would love to have some news. It was a happy time, before I had to become an ‘adult’ (do we ever?). In between times, came to Geneva, got married, had two sons, divorced..the usual. Am now grandmother to little Diego, who is half Thai and gorgeous. Would love to have more news if possible. Hi Girls, I was one of the 67 crazy inmates. All I remember I think Stoeger a girl from Iceland, a French girl – forgot her name was in my room. I think I remember Ruth. Get back to me. Had contact with Barbara for quite some time, we even went to Barcelona to learn Spanish. I then became a wanderer and parked myself in Goa, India. Hi Karen, I’m Ruth, you said you think that you remember me, well, here I am. I would be extremely pleased if you get in touch with me. I live in Paris, was married etc. Are you still in Goa? Hallo everybody. Yes I was a day girl in, I think, ’63. I came to Geneva, where I got a job with the International Labour Organization where I worked until retirement a couple of years’ ago. I got married, had two sons, David and Nicholas (both lovely boys of course!) am grandmother to Diego, whose mother is Thai, and to Amina, whose mother is Swis – quite a United Nations all together. I am in touch with Jane Asbury and Gill Taylor, who is living in South Africa. I would love to have more news of you all, and hope to hear something from you soon. Hi Ruth, still in Goa passing my time with caring for street animals. Are you still in touch with Barbara Gurtner? Or Sugar Altug from Ankara? If yes, could you tell either one or the other, both would be best, that I’d like to have news from them. Your’s Ruth.